1. Johanna Vassallo was born about 1910. 2. 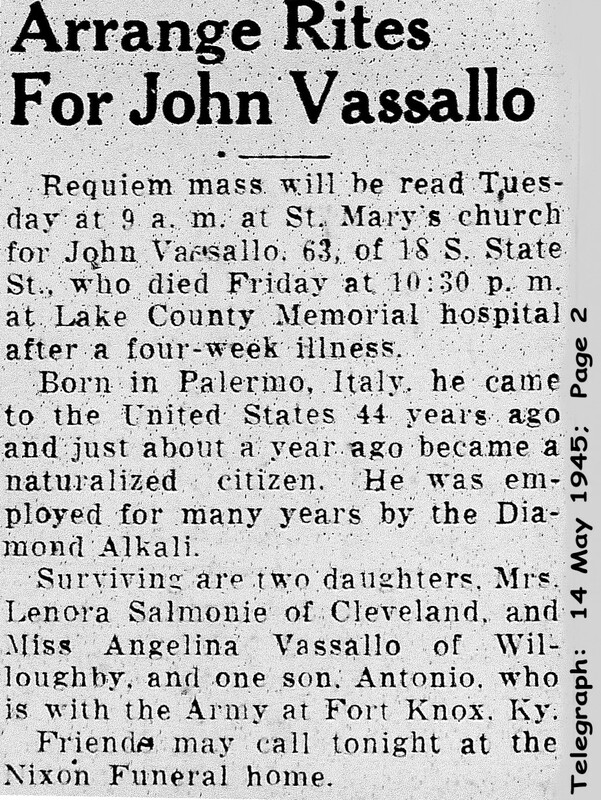 Lena Vassallo was born in either 1910 or 1911, at Painesville, Lake County, Ohio. She married first, John Gibaldi on July 16, 1928, at Cuyahoga County, Ohio. They were divorced in 1931. 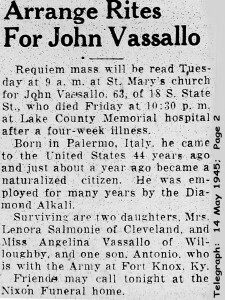 She married second, Giuseppe Salamone on May 20, 1933, at Cuyahoga County, Ohio. Giuseppe passed away in 1949. Lena married third, Joseph Scalero on April 7, 1951, at Cuyahoga County, Ohio. Lena died on October 25, 1963, at Women’s General Hospital, Cleveland, Cuyahoga County, Ohio. 3. Antonio Vassallo was born on Monday August 19, 1912, at Painesville, Lake County, Ohio. Antonio died on August 24, 1912, at Painesville, Lake County, Ohio. His body was interred at Painesville, Lake County, Ohio. 4. Josephine Vassallo was born on Tuesday September 23, 1913, at Painesville, Lake County, Ohio. Josephine died on September 18, 1920, at Storrs Street, Painesville, Lake County, Ohio, at age 6, as a result of an automobile accident. Her body was interred at Painesville, Lake County, Ohio. 5. Angela Vassallo was born on May 11, 1915, at Painesville, Ohio. She married John Novak. Angela died on October 3, 1999, at Cleveland, Cuyahoga County, Ohio. 6. Theresa Vassallo was born on Tuesday January 7, 1919, at Painesville, Lake County, Ohio. Theresa died on November 7, 1929, at her home, 524 Railroad Street, Painesville, Lake County, Ohio, at age 10, from a diabetic coma. Her body was interred at St. Mary Cemetery at Painesville Township, Lake County, Ohio. 7. 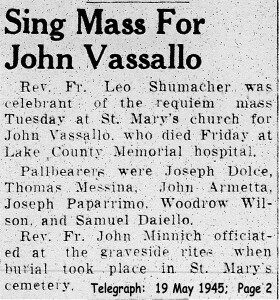 Anthony John Vassallo was born on Friday December 17, 1920, at Painesville, Lake County, Ohio. He married Harriet Bernice Hill, daughter of Howard Hill and Ethel Draper, on March 27, 1948, at Painesville, Lake County, Ohio. Anthony died on September 19, 1967, at Lake County Memorial Hospital- East, Painesville, Lake County, Ohio, at age 46, of a heart attack. His body was interred at Perry Cemetery at Perry, Lake County, Ohio.